Wings of Molanna flavicornis redrawn from Schmid (1980, fig. 741) . Wings of Oligophlebodes minutus redrawn from Schmid (1980, fig. 301) . 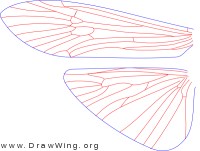 Wings of Farula jewetti redrawn from Schmid (1980, fig. 313) . Wings of Glossosoma hoodi redrawn from Schmid (1980, fig. 28) . Wings of Mystacides sepulchlaris redrawn from Schmid (1980, fig. 670) . Wings of Phanocelia canadensis redrawn from Schmid (1980, fig. 502) . Wings of Phylocentropus placidus redrawn from Schmid (1980, fig. 193) . Wings of Pedomoecus sierra redrawn from Schmid (1980, fig. 239) . Wings of Macronema zebratum redrawn from Schmid (1980, fig. 126) . Wings of Glossosoma lividum redrawn from Schmid (1980, fig. 10) .